– Spencer Pigot knew he had a better car than his qualifying effort showed and he proved that today during the Grand Prix of Portland. Though he started 17th, Pigot continued a trend that he has become known for and raced his way all the way up to 4th. It was the first race for Pigot at Portland International Raceway as Indy car racing returned to the Pacific Northwest for the first time since 2007. – In addition to an open test on Thursday, three practice sessions preceded Saturday’s qualifications. Pigot’s quick time came this morning in Practice 3, 10th overall at 122.582 mph. 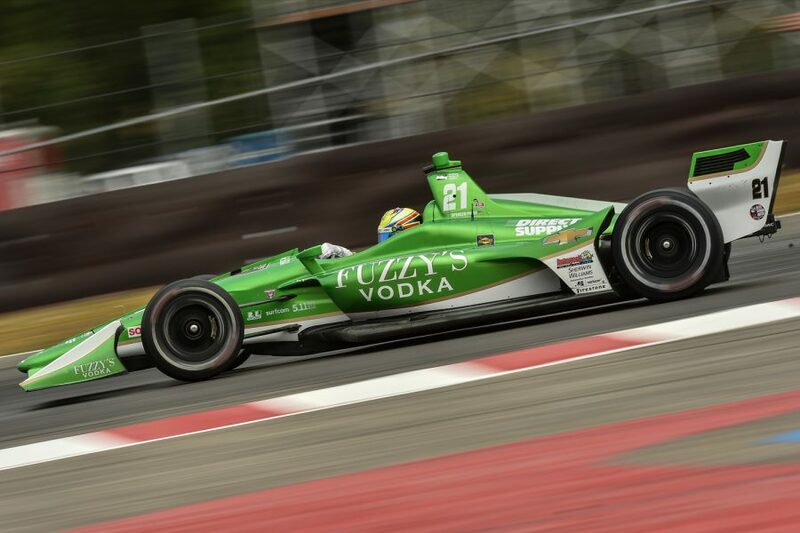 Pigot had not turned a lap at Portland International Raceway prior to Thursday; heading into qualifying, he had made 95 circuits of the 1.964-mile road. – In Practice 3, Pigot was 6th on the charts. Because he had an even-numbered finishing position, he was assigned to Round 1, Group 1 of qualifications. When the 10-minute session began, the 24-year-old headed out immediately on a set of black Firestone Firehawks. After three laps on black tires, Pigot sat 5th. He came into the pit lane for a set of red Firehawks and completed three more laps. Pigot would end the session with at 121.916 mph, a lap that had him sitting in 9th which translated into 17th in the starting lineup. – Pigot brought his No. 21 Fuzzy’s Vodka Chevrolet into the pits for his first stop on Lap 20, switching from the primary black Firestone Firehawks he had started on to the alternate red tires. Pigot was 19th following his stop, but was ordered to give up the position to Carlos Munoz after Race Control deemed Pigot had blocked Munoz. – On Lap 43, Power made contact with the tire barrier, bringing out the second full course caution of the day. Pigot was 7th and elected to use the yellow flag period to make his second pit stop, taking a set of sticker reds. He was 15th at the restart on Lap 47, however he used the fresh tires to his advantage and passed three cars in under two laps to move to 12th. – Pigot had moved up to 9th when the next yellow flag flew on Lap 55. He did not pit under this caution and vaulted up to 5th. Race leader Hunter-Reay came in for a stop on Lap 71, moving Pigot to 4th. Santino Ferrucci slowed on track on Lap 75 and the top four cars, including Pigot, ducked into the pit lane in anticipation of the caution. The yellow flag did not fly until after they had completed their stops, cycling Pigot back to 6th. – The Lap 81 restart saw Pigot execute a textbook pass around championship points leader Scott Dixon down the backstretch. Max Chilton, who did not stop under the yellow, had to pit on Lap 85. Pigot found himself back in the fourth position, chasing down Sebastien Bourdais. Pigot worked diligently to close the gap to Bourdais over the final 20 laps, but settled for 4th place. – Pigot’s 4th place finish comes on the heels of a 6th place just eight days ago at the short oval of Gateway Motorsports Park outside of St. Louis. He was the highest-finishing Chevrolet-powered driver in the Grand Prix of Portland. Today’s result is his third Top 6 finish in six races and is the second-best finish of his career. He finished 2nd at Iowa Speedway in early July, the first podium finish of his Verizon IndyCar Series career. – Pigot’s Ed Carpenter Racing team will enjoy a week off before heading to the season finale, the Grand Prix of Sonoma. The 2018 season will conclude at Sonoma Raceway on September 16.